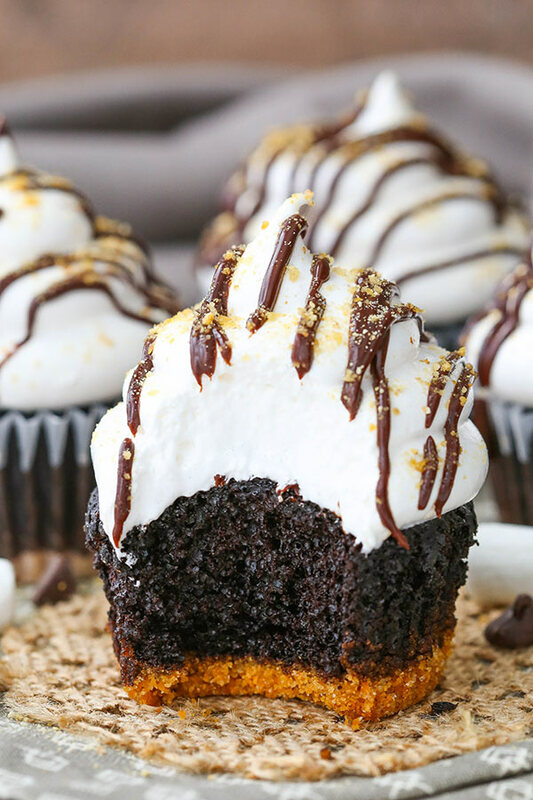 These Smores Cupcakes are the jam! 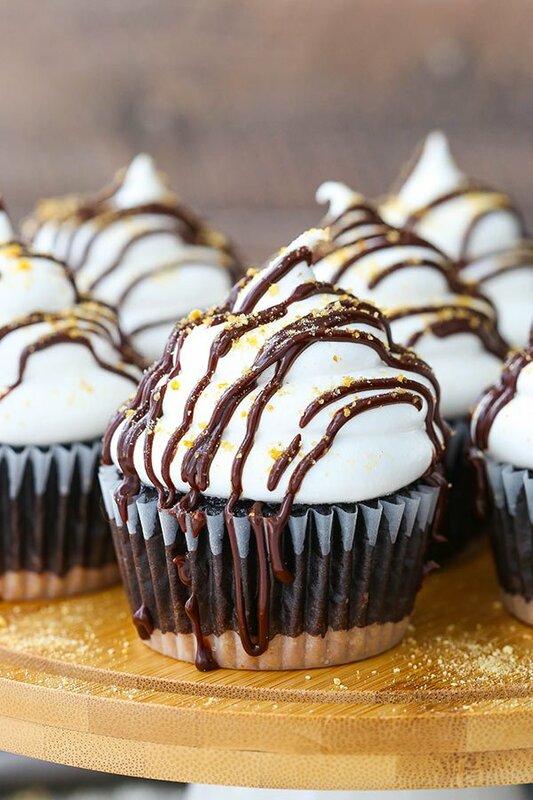 A super moist chocolate cupcake with a graham cracker crust, topped with a super light and airy marshmallow frosting! If you’ve been keeping up with Smores Week this week, then you’ve already seen my Smores Cheesecake and Smores Ice Cream Bars and you know that smores are all the rage this week! A bunch of us bloggers have gotten together to bring copious amounts of smores-inspired treats. To see what everyone else brought today, check out the bottom of the post. 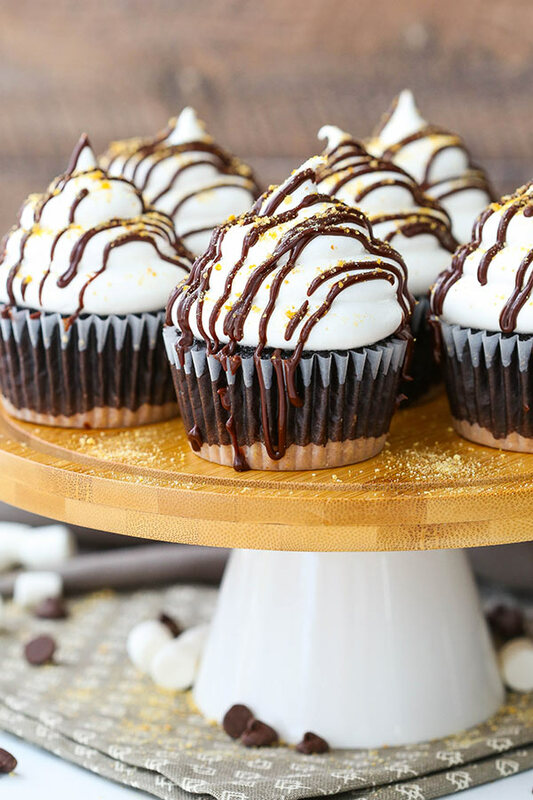 I’m sad to see Smores Week end, but I’m pretty pumped to end it with these cupcakes. So yesterday I had my 6 month check up/cleaning at the dentist. I know a lot of people hate the dentist, but I actually don’t mind it. I’ve actually fallen asleep while getting my teeth cleaned before. No joke. And I love leaving with that clean feeling mouth. And now our dentist has a tv in the ceilings above the chairs, so I get to watch tv while I lay there. Works for me! I’ve been fortunate to never have any cavities or anything, so it’s never been a bad experience for me. I never even had to get braces. I don’t know how I got so lucky, but I’ll take it. And I don’t think I’ve ever been to a dentist appointment without having them tell me how great my teeth are. After my dental hygienist finished cleaning my teeth yesterday she said, “I’m officially jealous of your teeth.” That’s saying a lot coming from someone who looks at teeth all day every day. I wish I knew what I’d done to get such great teeth. I’d make sure our kids do it one day. Maybe it’s all the milk I had to drink as a kid? I am a little shocked that after all the sugar that makes it’s way into my mouth these days that I don’t have more teeth issues. It must be a genes thing. I do always get lectured about flossing though. I just can’t seem to get into that habit. I’m not a fan. However, I am a massive fan of these cupcakes. When one of my coworkers grabbed one, his first comment was one of surprise. “A cupcake with a crust? !” Why yes, why not? And the crust on these might just be my favorite part. 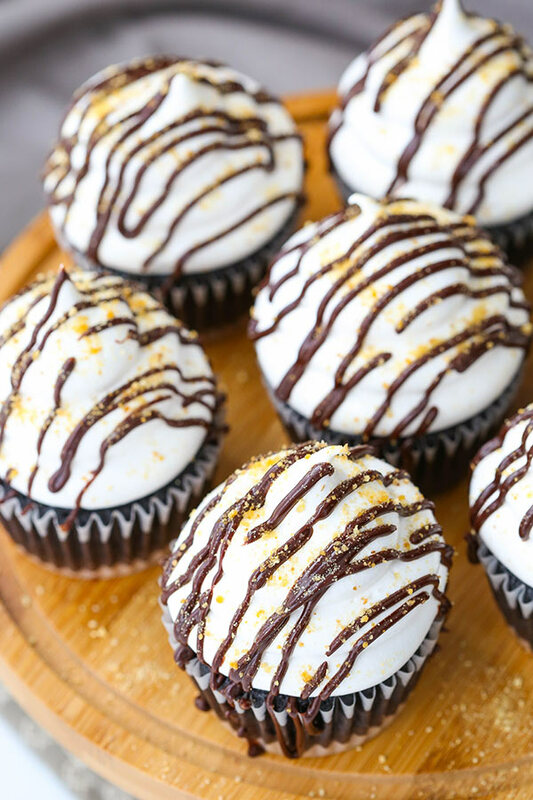 The graham cracker crust has some added sugar in it, and it is just perfect with the super moist chocolate cupcake. The marshmallow icing is incredible light and fluffy. I considered using marshmallow fluff, but I had a tough time getting it stiff enough. To be fair, it was when our air conditioning was on the fritz, so maybe it was a little warm. But this icing stood up to the warm air, so it won! And the contrast of the lightness of it, with the denser cupcake and the sweet, lighty crunchy crust is just perfection. You won’t be able to stop eating them. Then I finished them off with a little chocolate sauce and a sprinkle of graham cracker crumbs. Super cute, but totally optional. Heat oven to 325 degrees and prepare a cupcake pan with liners. Pour batter into cupcake pan, filling a little more than half way, and bake at 300 degrees for about 17-19 minutes. While cupcakes cool, make the meringue frosting. Combine egg whites, sugar, and cream of tartar in a metal, heatproof mixer bowl. Place over a saucepan with simmering water (or use a double boiler). Whisk constantly until sugar is dissolved and whites are warm, to between 120 and 140 degrees on a thermometer, about 4-6 minutes. Remove from heat. 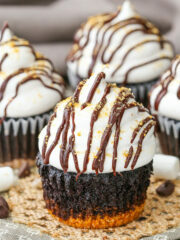 Pipe frosting onto cupcakes (I used Ateco tip 808) and top with chocolate sauce and graham cracker crumbs, if desired. 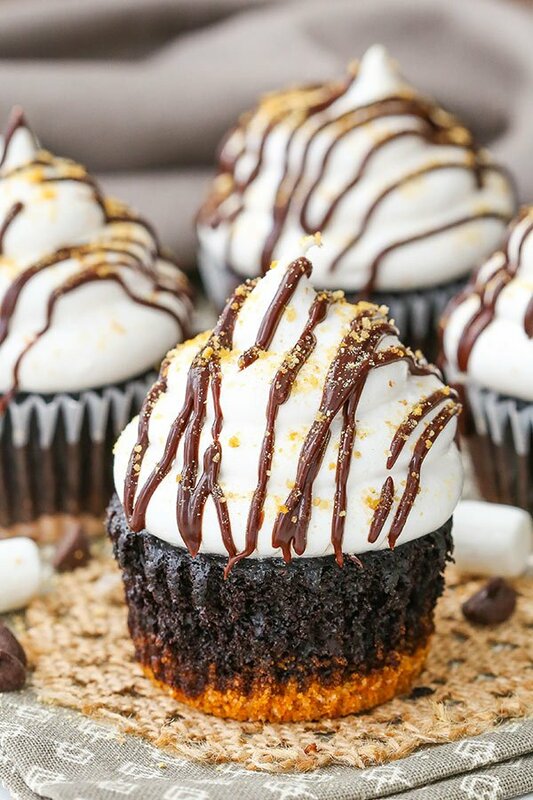 0 Response to "SMORES CUPCAKES"